Monday Motivation | Have you developed your personal "feel good" routine? Last week, I conducted an experiment. I decided to consciously employ one aspect of the Law of Attraction that I tend to forget. They say that in order to attract, you should first set an intention. Then you create affirmations around the intention. Next you visualize in order to raise your level of belief. Then you move into action. All these steps can be done simultaneously, by the way. Sounds like a plan, right? But tend to neglect the aspect around "feeling good." They say that you must "feel the feelings of having obtained what you want" to speed up the attraction process. In my experiment, I decided to actively take actions that instantly elevate my mood. Here's the thing, I can go from feeling amazing to feeling discouraged pretty quickly. Our thoughts are constantly running in the background and, if we aren't careful, we allow negative thoughts, judgement, and internal criticism take us down the wrong path. Here's the way I look at it. Everyone of us has a cell phone. Before bed, you probably charge your cell phone to prepare for the following day. Throughout the day, we use the phone which drains the battery. Even if you don't use the phone that much, the battery still goes down. Eventually, you'll have to charge it again. We're the same way. We could accomplish something great and be on cloud nine. Days, weeks, or hours later, we might be right back to feeling bad again. This is why we need to develop a "feel good routine." Basically, this is where you (1) notice when your feel good energy is low (or not where you want it to be). And (2) you instantly take on a set of actions that transform your energy to "feel good levels." First I identify what makes me feel good. 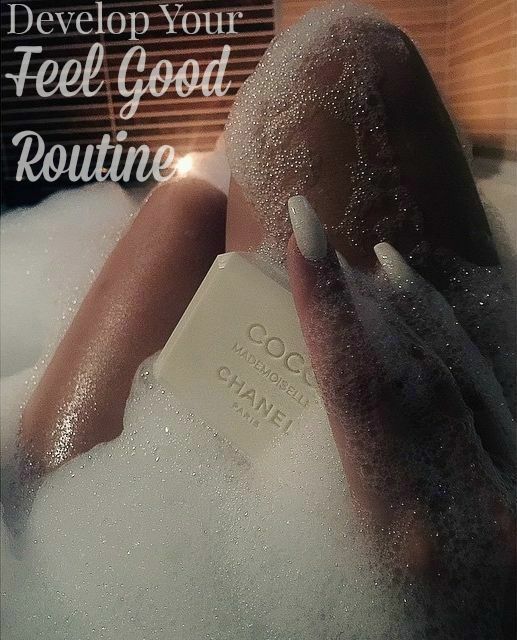 Ideas that came to my mind included maintaining a clean and inspiring environment, listening to my favorite songs, dancing, paying attention to my physical appearance, staying hydrated, looking at inspiring images, etc. Some of these actions have the ability to instantly change my mood. Those are the actions I'd employ as soon as I notice my levels draining. Fast action makes all the difference. Next I determined other mood changers that would have a more long term effect. For instance, working out may or may not instantly change my mood, but the results could sustain the feel good feelings, long term. 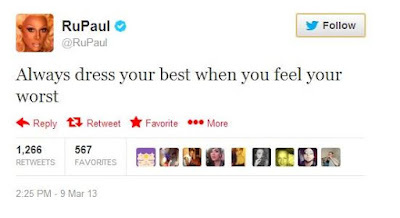 RuPaul giving us an example of a powerful "feel good" action. Then I put it into to practice. Basically, I tried to raise my mood (my vibration) as often as possible throughout the week. The results were pretty spectacular. This past weekend alone, I manifested several intentions that I'd had been holding on to for months. It was fun to experience and I can't wait to try it again and again. Oh, one thing to be careful of, make sure your feel good actions aren't counterfeit. Here's an example. While at the grocery store, I picked up some blondies as a snack. Blondies are my absolute favorite. They tasted so good, but after the momentary taste experience was gone, I could feel my blood sugar spike and overall my energy and mood dropped. Although it felt good on the tongue, my body did not interpret the treat as a "feel good" action. Anything that feels good for a moment, but creates negative long term results should not be a part of your routine. I invite you to create your own personal daily feel good routine. Something you can do right now to instantly elevate your mood. Then, while you're in a state of elevation, think and act on what you want to create. Immerse yourself in those feelings and see what unfolds. I definitely notice the difference in how I feel, behave and react in situations when I don't adhere to my Sunday evening feel good routine. I take the time to prepare lunches for me and my children, lay out our clothes for the week. I try and take it down earlier on Sunday evening, rake a warm bath, do some beauty treatments. When I skip this ritual I feel my week is very hectic.